Allow the learners to control their learning – so they’re more likely to engage with the whole learning activity. You should always let them see where they’re going on their learning journey and what options they have at each stage of that journey. You should cater for different preferred learning styles. Not everyone wants to engage with the same type of interaction. Offer learners choices of interaction to go some way to ‘personalizing’ the materials and so generate maximum engagement and motivation. Give the learners a reason to explore the materials and gather the information they need. Don’t ‘push’ information at them. Rather, let the learners ‘pull’ that information from the learning materials. Challenge the learners’ understanding – not just to find out how much they already know and, so, how much they need to learn but also to make them receptive to new ideas and ways of doing things. Give the learners choice over how they’ll learn – building in opportunities for those who need more information to get it as well as for those who need less information to learn by experiment and experience. Emphasise – in the learning materials - that these choices produce consequences. This can be done via establishing a scenario with various results depending on the learners’ decisions. Generate ‘tension’ throughout the materials. If you make learners care about the decisions they take, they’ll become more engaged with the learning materials and motivated to not only ‘succeed’ within the parameters of the learning materials but also to apply, in the real world, the lessons they’ve learned. Look for other ways– that is, things not specifically related to the materials’ learning objectives - to reward the learner for persevering with the learning materials. This could include permission to play a game (contained within the learning materials) for a while once certain key points are reached. Give helpful feedback following any assessments the learners take. That’s easier said than done! Instituted tastefully, interaction can help to make learning materials more intuitive for the user – making their message more memorable. Of course, Harbinger Group’s Raptivity is a rapid interaction development software tool that comes with a library of pre-built customizable learning interactions. Users have access to over 180 pre-programmed Flash and over 110 HTML5 interactions including games, simulations, brainteasers, interactive diagrams and virtual worlds. Moreover, each type of interaction includes a number of standard templates – one of which is likely to be appropriate for any ‘learning situation’. The user merely has to add content to the chosen interaction. 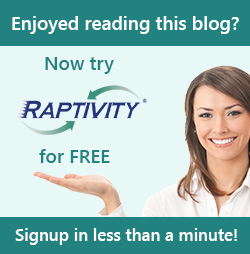 For more information, see Raptivity®. Note: This blog has been posted by Raptivity Marketing Team on behalf of Bob Little. For over 20 years, Bob Little has specialized in writing about, and commentating on, corporate learning – especially e-learning – and technology-related subjects. His work has been published in the UK, Continental Europe, the USA and Australia. You can contact Bob via bob.little@boblittlepr.com. His e-book, ‘Perspectives on Learning Technologies’ (e-book; ASIN: B00A9K1VVS) is available from The Endless Bookcase and from Amazon. It contains over 200 pages of observations on issues in learning technologies, principally for learning & development professionals.